If the University of Hawai’i could pack past results for its current trip in Southern California, last week’s game against Long Beach State would definitely be in the luggage. 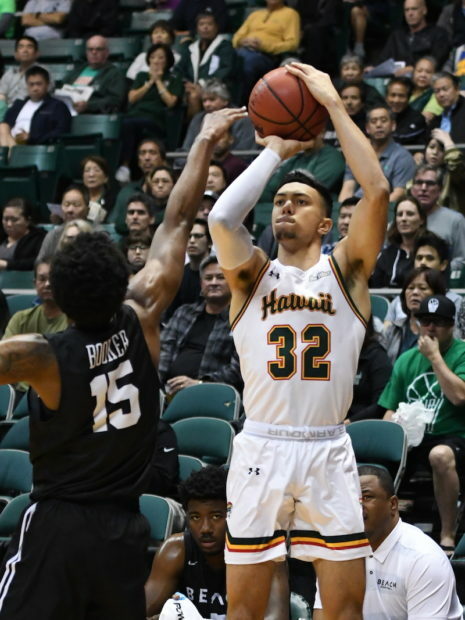 The Rainbow Warriors will face the 49ers in a Big West Conference rematch just seven days after UH’s convincing 74-57 win at the Stan Sheriff Center. Thursday’s game is scheduled to start at 7:00 p.m Pacific Time (5:00 p.m. Hawai’i Time), and it will be available via video streaming through ESPN3 (www.espn3.com or the WatchESPN app). The biggest difference between last week and this one is the venue. Thursday’s game will be at the Walter Pyramid in Long Beach, Calif. The Warriors are 0-6 in the Pyramid since joining the Big West in the 2012-13 season. It is the only current Big West venue that the Warriors have not won a game in. 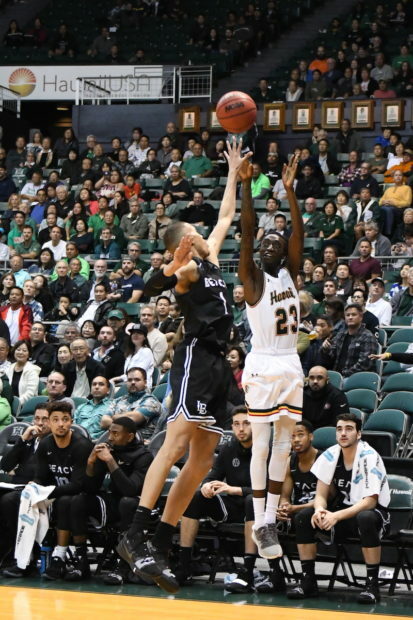 As a result of UH’s past frustrations in the Pyramid, Long Beach State is the only Big West team that the Warriors have never swept during the regular season. They are looking to change that this year, with a home win over the 49ers already in the bank. Last week’s game, however, was at the Stan Sheriff Center in Honolulu, and the 49ers have a 1-10 record away from Long Beach this season. Hawai’i is 13-8 overall and in fourth place in the Big West standings at 4-3. Long Beach State is 8-15 overall and in seventh place at 2-5. The Warriors took the first meeting thanks mostly to a solid defensive effort that limited the 49ers to 38.5 percent field goal shooting, including 25 percent (3 for 12) from 3-point range. Deishuan Booker, the 49ers’ dynamic guard, was limited to 14 points on 3-of-11 shooting from the field (he went 8 for 11 on free throws). In his six other Big West games this season, Booker averaged 27.8 points per game and shot 46 for 86 (53.5 percent) from the field. Booker, a 6-foot-3 senior, is averaging 17.9 points per game overall and leads the nation with 159 made free throws. He is also among the national leaders for free throw percentage (.882) and is averaging 4.7 assists, 3.0 rebounds and 1.6 steals per game. In summary, he is one of the best all-around guards in the Big West, and holding him in check again will be one of the priorities for the Warriors. Mason Riggins, a 6-9 senior forward, led the 49ers last with 18 points on 8-for-12 shooting in the loss at Hawai’i. His season averages are 5.9 points and 5.3 rebounds per game. Temidayo Yussuf, a 6-7, 265-pound senior center, is averaging 12.0 points and 6.8 rebounds per game. He was limited to three points and two rebounds in just eight minutes at Hawai’i last week, when he was just returning from a knee injury. Bryan Alberts, a 6-5 senior guard, is averaging 10.4 points per game and leads the team with 50 3-pointers. He scored six points and shot 1 for 5 from 3-point range against the Warriors. After beating the 49ers last Thursday, the Warriors experienced a humbling 75-54 home loss to UC Santa Barbara on Saturday. Senior guard Brocke Stepteau sparked last week’s win over the 49ers, tallying 16 points and five assists off the bench. Junior guard Eddie Stansberry added 14 points in that win, and he leads the Warriors in scoring at 12.4 points per game. He also ranks second in the Big West for 3-pointers made with 61. Junior forward Zigmars Raimo is averaging 11.5 points and 6.6 rebounds per game, and is second in the Big West for field goal percentage at .576. Senior forward Jack Purchase is contributing 11.4 points and 6.1 rebounds per game, and ranks second on the team with 47 3-pointers. He has made 171 3-pointers in his career at UH, and is nine away from tying the program record of 180 set by Zane Johnson from 2010-12. Sophomore point guard Drew Buggs is averaging 8.8 points, 5.3 assists and 4.2 rebounds per game, and spear-headed the UH defensive effort against the 49ers last week. Buggs attended Long Beach Poly High School prior to signing with UH, and he is expected to have a contingent of family members and friends in attendance. 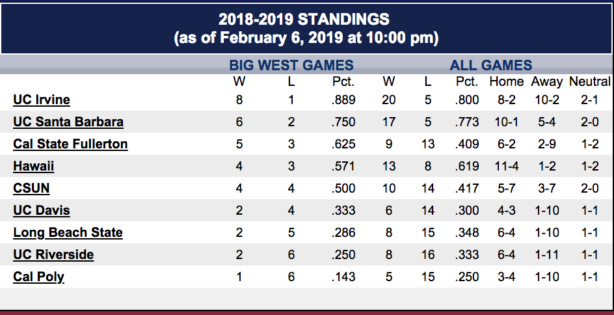 Two other Big West games on Wednesday impacted the top of the standings. First-place UC Irvine (8-1) and second-place UC Santa Barbara (6-2) both won games to remain ahead of the pack. Where: The Walter Pyramid (4,200) – Long Beach, Calif.